Earlier this month, Chanel opened a magnificent flagship store in Old Bond Street, which is to date their largest shop in the world. The windows displayed the collection from the Métiers d'Art Edinburgh show, presented last December at Linlithgow Palace in Scotland. This is their Pre-Fall 2013 collection. These designer pre-collections are becoming increasingly important and are actually coming out twice a year as a Pre-Fall collection in the summer and a Cruise collection just after Christmas. The inspiration here was Scottish style and heritage and, not surprisingly, the collection includes tartan and traditional knitwear and patterns. These are often teamed with romantic, long, lace-trimmed dresses in black or cream. I loved this grey knitwear and red tartan teamed with a long black dress with lace-trimmed hem and tough little black leather lace-up ankle boots. I stood for a long time just gazing into the window at the mannequin below. 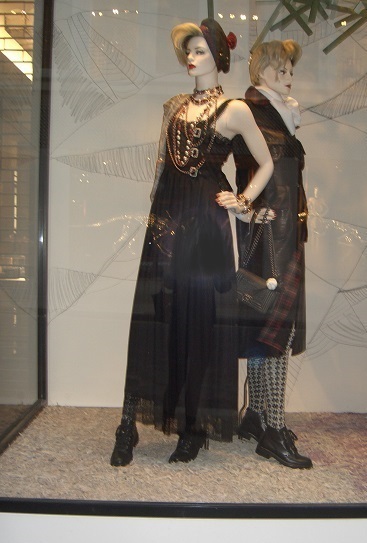 A Black Watch Tartan Tam o'Shanter with a red pompom on her head, she wears gold, pearl and red stone chains on a long black dress with lace-trimmed bodice and hem. Notice the detail of the three vertical pearl buckles on the bodice and the thick patterned tights and lace-up boots. Then there was this cream, lacy dress with plaid stole around the shoulders. The mannequins all wore red lipstick and nail varnish. I think this look could be inspiring for the season ahead. Fashion has become very much a two-way process between designers and street fashion. Whilst key points from designer collections often influence high street and street style, young street style fashion in turn seems to inspire the designers. Just look at the thick tights and tough little boots above teamed with fragile dresses and the grunge theme of the Yves Saint Laurent Autumn 2013 collection.